It’s still way too early to make strong pronouncements, but signs are that the desi graphic novel is coming of age. When Sarnath Banerjee's Corridor, widely marketed as the first Indian entry in the medium, was published in 2004, the response was mixed: it was widely felt that though Corridor was clever, and good for a few belly-laughs, it didn't break new ground – the drawings in particular didn’t meet the high standards fans of international graphic novels have come to expect. Last year, Banerjee and Anindya Roy co-founded Phantomville, a publishing house exclusively for graphic novels (and a brave venture for the Indian market). Their first publication was The Believers, a poignant but unspectacular story about a Muslim man returning from Edinburgh to the small Kerala town he grew up in and discovering that his older brother has become involved with a terrorist operation. This was not much more than a moderately engrossing tale told in (moderately well-drawn) pictures; what it had going for it was the price (Rs 150), very low by graphic novel standards. One of the challenges that Phantomville faces is supervising what can be a torturous artistic collaboration. The best graphic novels seek to attain a perfect balance between the written word and the visual, and this requires just the right synergy between writer and illustrator. Though I’m sure there are many fine writers and artists in India, most of them would still be unfamiliar with that collaborative process, at least when it comes to working on a book-length project. Hopefully this will change soon, so the medium can build on the promise shown by the last couple of titles. A ratherful insightful post,I wasn't aware of the presence of such novels.Time to scavenge through Darya Gunj and try to find some of them.However,the drawings in Barn's Owl... seem rather old.Maybe the black and white colour affects me a bit. 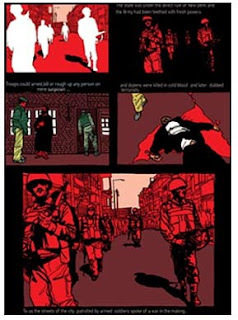 As for Kashmir Pending,the artwork seems hand-made(if that's the word) but three of the panels have the same photo(the one with the soldiers walking through the streets),only the colour scheme is different.So these guys use Photoshop as well or is this just a rare one? I quite enjoyed Corridor because of the uniqueness of its format (& that for a change I could totally identify with the mileu of a graphic novel! 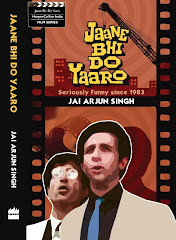 ), & am looking forward to Sarnath Bannerjee's new book. The title seems to be an almost literal translation of a well-known Bengali satire written in the 1860s - "Hutom Penchar Naksha" by Kaliprasanna Sinha - This is a hoax - http://www.geocities.com/harindranath_a/maha/kaliprasanna.html. I need to ask someone to get it for me from India. Guess what I randomly found at a bookstore here? Ol' James' A Majestic Innings. Got it yesterday. Just started on it. Have only finished a fantastic impressionistic piece on Sydney Barnes. Yep agree with you that the G novel is coming of age in India. In these nascent stages it's interesting to see what we can do with the medium. Can we invent new ways of narration or will we walk the trodden path? It's insightful that you say - ‘Internationally, the medium has developed to the extent that the genre of the stories being told is not a big issue.’ yes, that’s what I see in the international Gnovels, a lot of care given to details and the entire graphic design of the book. When I see what has been done in India I see that we details are not looked into, especially when it comes to the drawings. With Kashmir Pending I see that the artwork is really good, finished and also produced well. Kudos to Phantomville. So here’s to more good Indian Graphic novels . Abhinav: yes, I think they would have used Photoshop. Like I mentioned, that page isn't the best example of the book's artwork. A couple of my earlier posts on graphic novels are here and here. I doubt you'll find many of these in Daryaganj though! Any idea where to get Phantomville publications -- if you live in the USA? I can find S. Bannerjee's books, but not _The Believers_ or _Kashmir Pending_. Neil: try emailing Anindya Roy at the ID given on the Phantomville site: http://www.phantomville.net/contact.html. I think the company is still small-scale enough that they would reply to inquiries. I am quite pleased with Kashmir Pending, despite average writing and above-average artwork, because of its take on a serious issue with the processors Corridor and Barn Owl being pure Pulp works. All said, I see Kari as the first fully-realized Indian Graphic Novel with writing and art complementing each other. I am desperately searching for a copy of Kashmir Pending. It is out of print and I have been having difficulty tracing contact info for publishers. Any suggestions?